Banking on the skills of our qualified team of professionals, we are involved in offering Four Column Hydraulic press. This product is available at innovative technology. Our product is higher capacities as per customer requirements. This Four Column Hydraulic press is reliable operations, long functional life and uninterrupted performance. 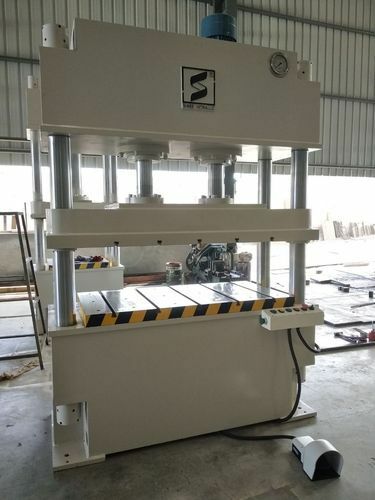 Established in the year 2011, we, “Shree Hydraulic Press Industries” have gained immense experience and recognition in the markets for manufacturing, supplying and exporting a wide an exclusive Hydraulic Press. The offered range has been made from the usage of best quality raw material and is availed to the customers at the most comprehensive and market leading price range. We have made sure that the complete range is in compliance with the standards of the industry, and this has been kept possible through our expert surveillance. In our wide and sprawling range we have various kinds of C Frame Hydraulic Press, H Frame Hydraulic Press, Deep Draw Hydraulic Press, Work Shop Press, Rubber Moulding Hydraulic Press, Long Bed Hydraulic Press and Iron Worker, to offer, and all of these are the best in compositions. Offering the optimum performance that they are perceived of, these machines and heavy duty presses have been widely appreciated for their extensive features such as dimensional accuracy, optimum performance, longer service life and easy installation. Customers can easily avail from us a wide range that has been made to cater to their variegated needs. We cater our services all over globe.